Yesterday I took my annual trip to Brookside Garden’s Wings of Fancy butterfly exhibit in Wheaton, MD. I started going here after my son’s preschool took a field trip there about six years ago, and every year when I go I promise myself that I am going to come back more often! This year I almost missed the butterfly exhibit Wings of Fancy – it closes this Sunday, September 19th. The butterflies are housed in a greenhouse type building. Admission is $6 for the day, and you can leave and come back that same day if you are really into it. It does get a bit warm in the butterfly house – and butterflies like warm, so dress lightly. Speaking of warm, I learned an interesting fact yesterday… the Blue Morpho butterfly lets its’ wings open more on cool days to warm itself. If you ever try to photograph a Blue Morpho, you learn quickly that as soon as they land they close their wings. I took this shot on one of my previous visits to Wings of Fancy in May of last year. I didn’t realize why I was so lucky to catch a Blue Morpho with his wings apart until this last trip! This trip I took my new (as of June) 70mm-300mm Nikon lens to try it out on the butterflies. I got some great eye-level shots of several butterflies feeding with great out-of-focus backgrounds since I was racked out at 300mm for many. The thing I forgot, was that I don’t have the close focusing distance with that lens, so there were plenty of shots I missed because I could not achieve focus that close. Also, I didn’t get many shots looking down at the butterflies like this one above, since I’m not that tall! Next time I think I’ll take two lenses. If you’d like to photograph butterflies and live in the DC area, this is a spot not to miss! 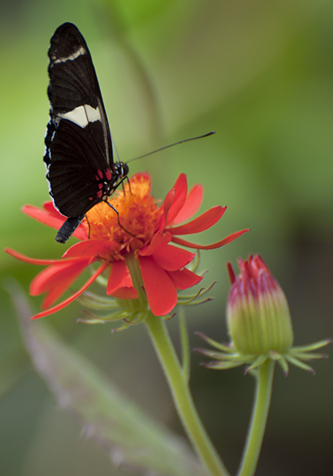 Even after the butterfly exhibit closes, the gardens are a great place to take your camera – and the gardens are free! Brookside Gardens is definitely on my list of favorite shooting spots! This entry was posted in Locations and tagged Butterflies, Locations. Bookmark the permalink.